Amy MacLeod, delivering her talk,” Career advice for teenagers: Value your values.” Photo by MIV Photography. 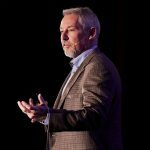 Eli Fathi, CEO of MindBridge Analytics was one of eight speakers to take the stage, sharing his story of growing up with nine family members in a one-room apartment. No television, no internet – and no way to imagine the AI tech that would someday become the foundation for his own successful company. Eli Fathi, delivering his talk, “The Intersection of Imagination: From Childhood Dreams to the Power of Machines.” Photo by MIV Photography. The focus of the evening was the importance of looking ahead to the future, however unpredictable it may sometimes seem. Dr. Phil Wells, head of the Department of Medicine at the Ottawa Hospital, shared the crystal ball potential of new technology in healthcare. Military veteran-turned-CEO John Proctor, of Martello Technologies, shared his insights from two different career worlds. 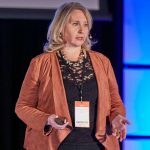 Amy MacLeod, Mitel’s first corporate diversity officer, framed her talk as a question: what career advice would she give to a teenager facing an unknown future? Travelling back in time for an answer, MacLeod reflected on how her mother – who had no career outside the home – was still able to guide her children to success. For some, including Shopify’s Anna Lambert and SocialRise CEO Connor Larocque, the theme focused on the challenge of maintaining values alongside emerging technology and social media. Lambert described how tracking her daily cellphone usage brought a change in perspective. In one week, she tracked five hours spent on Instagram – calculating that over time, those numbers would accumulate to 574 days of her life on the platform. Lambert emphasized that while social media can be an amazing tool, too much screen time can leave us feeling disconnected. Katherine Cooligan, partner at Borden Ladner Gervais LLP, encouraged women in leadership positions to make bolder moves. Jim Perkins, founder of the Capital City Condors adaptive hockey program, shared his lessons on finding contentment. 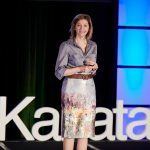 TEDxKanata organizer Roxanna Grecco said all 400 tickets sold out for the event, but the demand didn’t stop there. 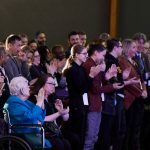 After sponsors and other last-minute attendees, the total number of attendees rose to over 500. 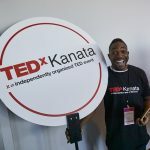 This year marked the fifth edition of TEDxKanata. 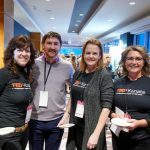 Since it began in 2015, several other TEDx spinoffs have launched within neighbouring communities, but according to Grecco, TEDxKanata remains unique.